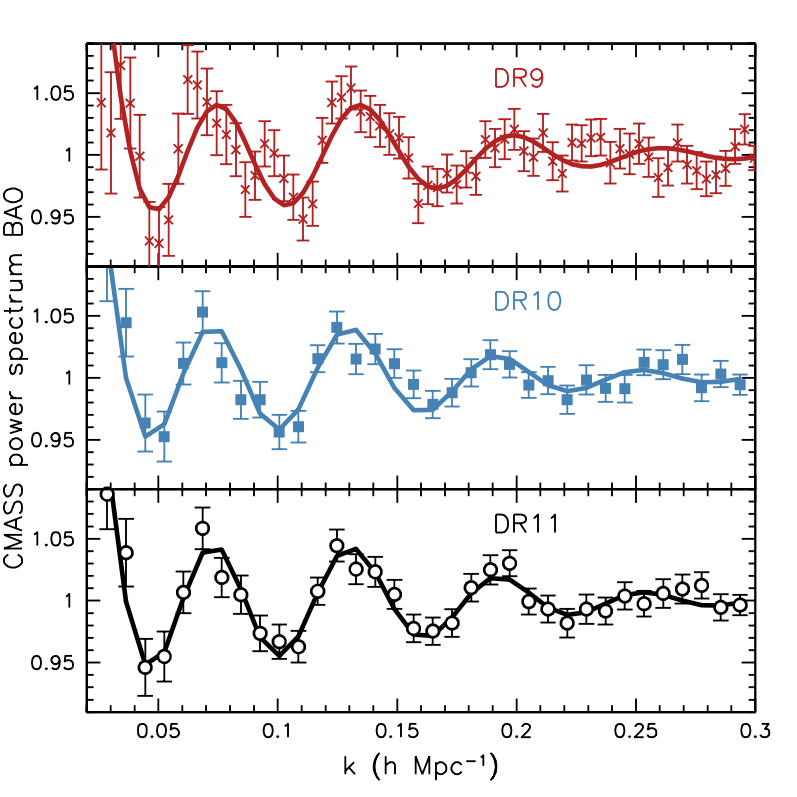 Large surveys measuring the positions of galaxies, reveal a complicated large-scale structure within the observable Universe. The galaxies trace the distribution of matter in the Universe, and they form where there are the highest concentrations of material. 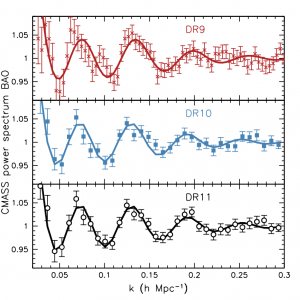 The patterns of galaxies observed therefore encode the physical processes in the early Universe that form peaks in the density field, leading to potential measurements of the cosmological densities of Dark Matter, radiation and baryonic material. As we look to more and more distant galaxies, we see further into the past history of the Universe, seeing galaxies at earlier and earlier times. We can compare the patterns of galaxies observed at different epochs to each other, and obtain information about how much the Universe has grown in that interval of time. Using these techniques, we find that the expansion of the Universe is accelerating, and we can obtain information on the exact form of this acceleration. ICG researchers are leading, and are involved in, many galaxy survey projects, including the Baryon Oscillation Spectroscopic Survey (BOSS; www.sdss3.org), the Dark Energy Survey (DES; www.darkenergysurvey.org), the extended Baryon Oscillation Spectroscopic Survey (eBOSS; www.sdss3.org/future), the Dark Energy Spectroscopic Instrument (DESI; desi.lbl.gov), the VIMOS Public Extragalactic Redshift Survey (VIPERS; vipers.inaf.it), and the ESA Euclid mission (sci.esa.int/euclid). 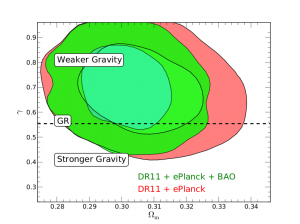 Using these surveys, and novel techniques developed to statistically analyse them, we extract the information and turn this into cosmological measurements. In turn, these are used to constrain theoretical models, and thus to understand the Universe. Cosmological constraints on the matter density and growth of structure (parameterised by gamma), derived from BOSS galaxy survey measurements. The contours show regions of increasing likelihood, and the GR (standing for Einstein’s theory of General Relativity) prediction is an acceptable model for these data (figure taken from Samushia et al. 2014; http://lanl.arxiv.org/abs/1312.4899).